Pigments are labeled in three ways- with a common or marketing name, an alpha-numeric system, and with a more scientific “pigment name”. As the marketing name can vary from brand to brand dramatically, it can either be very useful (if it follows a historic precedent) or could mean almost nothing (if it’s very poetic). However, the alpha-numeric naming system is always consistent and is essential to understanding the type of pigment you are buying. This is one of the most important things to pay attention to when buying paint. The scientific/ chemical naming of pigments is also very reliable, but often more difficult to remember or understand. Even then, pigments are manufactured in various ways and with various types of binders, depending on each brand name. As such, this means that even pigments that have the same alpha-numeric pigment code don’t necessarily handle or look exactly the same. They will be similar, but individuated, with each brand’s version of a pigment having a slightly different hue and/or handling characteristics. Sometimes, the marketing name will feature the word “Hue”, along with the common historical name, such as “Cobalt Blue Hue”. This indicates that the tube features a prearranged combination of (generally cheaper) pigments to arrive at a similar hue to the “primary” name. The issue is that these mixtures almost never handle the same way as the single pigment does. For mixing purposes, it is almost always better to purchase the single pigment. This is one of the reasons why we always look at the alpha-numeric pigment name, and not the marketing name. Somewhere on each tube or pan should be an alpha-numeric label. It’s important to know how to read it. Many labels will feature the marketing name combined with a tag that has the alpha-numeric pigment name, such as “Cadmium Yellow (PY35)”. The pigment numbering system will always have a “P” (for pigment), atleast 1 additional letter (such as Y for yellow, Br for Brown, O for orange, R for red, V for violet, B for blue, G for green, etc.) and a number. Each pigment in a color category gets a special number, only used for that pigment. Thus, you always know, for example, that you’re getting Ultramarine Blue when you purchase PB29, or Viridian when you get PG18, regardless of mild brand variances. If the label features more than one letter-number combination, then you know you are getting a multi-pigment mixture in that tube, and that may cause issues later on when you’re actually painting. It’s good to know, and I generally (though not always) avoid multi-pigment tubes. Unfortunately, this can be a little vague, as the labeling process varies from company to company. 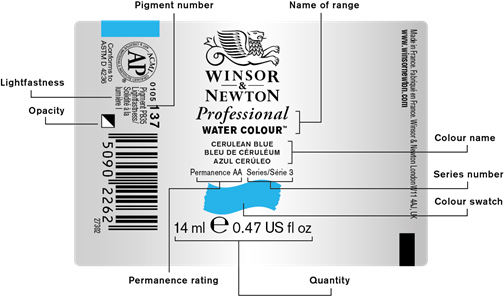 Winsor Newton, for example, has a “Permanence” rating which is positioned prominently, with AA (the best), A, B, etc., but it’s unclear exactly how the rating is achieved or what it means. Alternately, Winsor Newton also has a “Lightfastness” rating which is much less prominently placed, on the side of their tubes where it’s hard to see. This label follows a consistent testing process run by the ASTM (American Society for Testing and Materials), and has a labeling system from 1-5, with 1 representing excellent lightfastness. Many other brands follow a similar rating method, such as Daniel Smith and M Graham, where the system is 1-4, with 1 still being the best. This is, in my mind, the number to look out for. Still, other Artist Grade brands use other systems, some of it depending on where they are made globally. For example, Holbein has a three star system, with 1 star being the worst and 3 stars being best. How is it achieved? I don’t know? Are there standards they use in Japan to arrive at these ratings? I don’t know. Perhaps it exists somewhere, but it’s hard to find the info. This gives me pause about using a lot of Holbein paints, even though many of them really may be perfectly fine. What do I do then? Stick to brands I know, that have an ASTM label or something an alternate rigorous system, and stick to pigments I know. And, of course, I skip the worst offenders- Alizarin crimson, Rose madder, Aureolin, Opera Rose. Those are the biggies. But if I do buy a new pigment, I’m always hunting for the ASTM label, and I’m always looking up results on handprint.com or elsewhere. If others care to share more info in the comments, please do. I’m happy to gather additional new info.